To many, the beginning of the year signifies a time to re-strategize and set achievable goals. To writers/poets/artists the case is no different. Some even pick the period to do better things they’ve always loved doing. 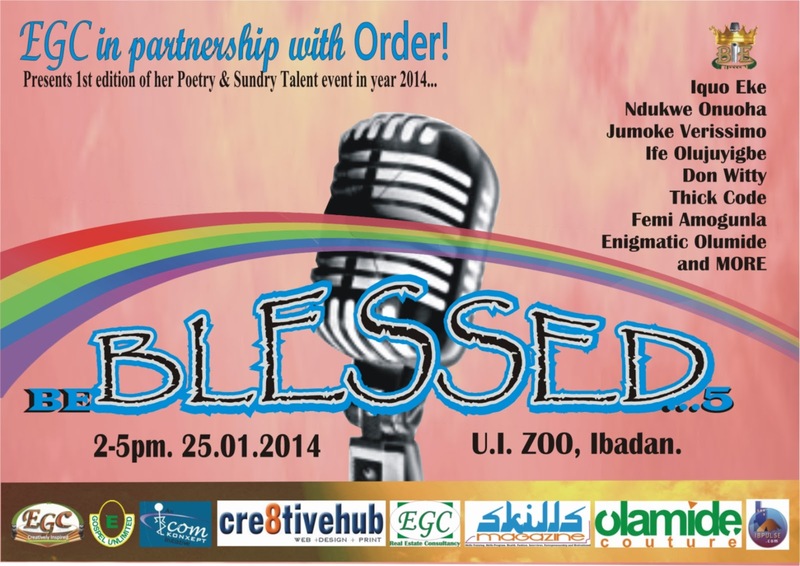 Join us last Saturday of January 2014, as we present the 5th edition of our Poetry & Sundry Talent event called ‘Be Blessed’, aka ‘Poetry Uncaged’, aka ‘The New Beginning’. Now entering the 3rd year, we will be giving opportunities for Talented people to step up and rock the mic alongside Master Poets to be featured on that day. Remember, this event was created to make a room for both established and upcoming performers to mingle/connect/inspire/motivate one another with their Talents. Also Watch Out for those Wordsmiths who rested their pen for a while and now are making comebacks to the Spoken-Word-Poetry scene. Venue: Zoological Gardens, University of Ibadan. Featuring Poets: Ndukwe Onuoha, Iquo Eke, Dapo Benson, Ife Olujuyigbe, Ola Writes, Street Poet, Yommy Bishop, Femi Fairchild Morgan, Thick Code, Enigmatic Olumide, & more. Comedy interludes will be given by Don Witty & Toyese. Musical interludes will be done by Sam Praiz, Deni Yanda, Victor Akinwunmi, & more. You have not seen an event like this one before... Don’t Miss it!